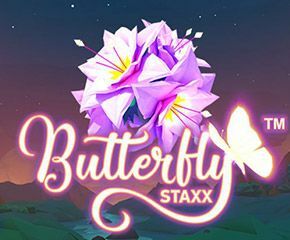 If you love the view of a garden with lovely flowers and beautiful butterflies, then you will definitely fall in love with Butterfly Staxx slots. You get to play with five reels and 40 paylines that remain active all the time. The reels are placed over the backdrop of a valley below the night sky with colourful flowers and glowing green fireflies. The music of meditation in the background sounds very healing and helps you keep your calm. The betting starts with 20p and you can bet up to £400 each spin. This colourful and mesmerising new slot game with butterfly theme was developed by NetEnt. One of the leading casino developers in the world with experience spanning over twenty years in the industry. All their games are unique in terms of gameplay as well as the kind of rewards you can win. Visually, Butterfly Staxx slots game is loaded with high-definition graphics and rich colours that are truly a treat to the eyes of the player. There are dual colour red-orange, pink-purple and blue-violet flowers along with a golden glowing butterfly. The symbol of the butterfly pays you the most with 60 times on your bet with five of its kind on the reels. J, Q, A and K of play cards in various shades of green are the low payout symbols with 20x each. There are two additional flower symbols that help you unlock bonus features. They are the multicolour flower and a purple lavender flower symbols. Bonus Wild: The multi colour flower symbol is the wild feature of this game. It covers for all the base symbols but does not substitute the scatter symbol. It can appear in a stacked formation that can activate a large number of combinations. 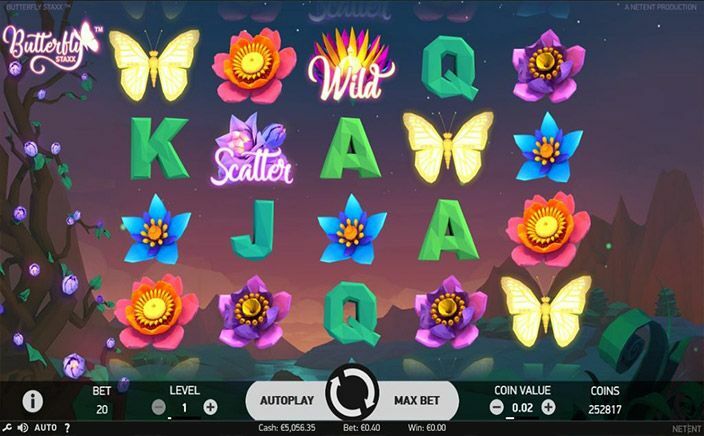 Bonus Scatter: The purple-lavender dual colour flower is the scatter symbol of Butterfly Staxx slots. It gives you free spins of 5, 6 or 7 with 3, 4 or 5 symbol landings. During the free spins, you only get green cocoon symbols on the reels. Active cocoons turn into butterfly symbols and remain that way until the end of free spins. This helps you win massive stakes of rewards. With plenty of surprises and bonus features, winning in Butterfly Staxx slots game is just a cake walk. The slots game is loaded with rich and colourful graphics that will keep you entertained all along.